"In this world there's two kinds of people, my friend. Those with loaded guns, and those who dig. You dig." I stared at the poisonous fish I was about to eat. It stared back at me, fully aware that we were locked in a stalemate of Mutually Assured Destruction. I could kill it and eat it, and it could simply poison me in revenge. "Look here blowfish, we need to have a talk." It swam closer and looked attentive. "Here's how it's going to go down. In a minute, the chef is going to plunk you on a table and slice you up for my dinner. But don't be mad about it, hey, you've lived a pretty cushy life when you think about it. Plenty of food, a good view of the staircase over there, you've had the same friends here in the tank your whole life. Its just your time. Let's be friends, and I'll honor your presence with a nice blog post about how nice your spots look. OK? Great, glad we had this talk." He swam away, and flicked his tail in an ambivalent gesture. Not sure I had gotten anywhere, I walked into the Fugu restaurant and sat down next to my brother's friend Kevin. In a few minutes, my blowfish was now a plate full of razor-thin sashimi, artfully arranged around a white plate. The cuts were so thin you could see the white plate through them, they looked almost invisible. "Kevin, seeing as you've done this before I would rather watch you convulse and die before I do, you wanna have first go?" Kevin picked up a piece with his chopsticks and with no hesitation chomped away. His wife and I waited in morbid anticipation for something dramatic. Suddenly, Kevin began to shake violently and his eyes crossed. I frantically waved for the waitress, and as she rushed over, suddenly Kevin stopped and smiled. "Don't worry, its fine. You see, I've slowly been building up my tolerance and am now immune. Your turn!" Nice one. The fugu thin slices taste OK, especially when dropped into a bit of boiling water for a half-second which makes them crisp up like a nice chicken strip. 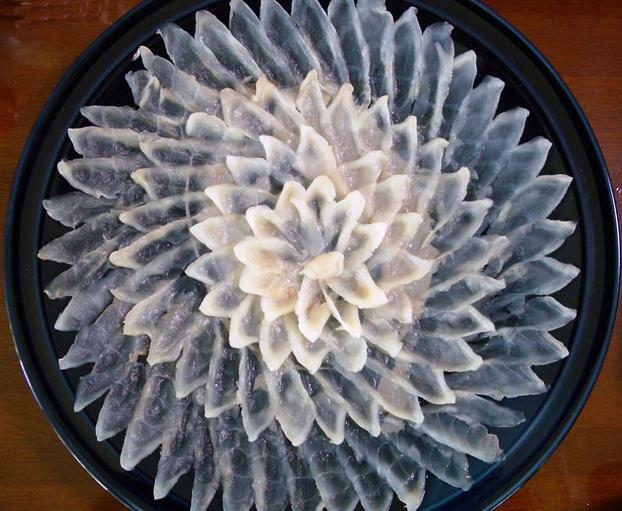 But when we tucked into the thicker fugu skin, it was a different matter. The meat was so slimy and gelatinous it was hard not to get nauseous. Then we tried some of the meat directly off the bone, it was also slimy and tough like an overcooked jellified octopus. 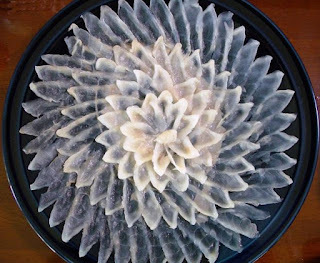 It turns out Fugu isn't so great, its more the thrill of tempting death by eating something that kills between 10-100 people every year. I said a silent thanks to my friend from the fish-tank who had decided to accept his fate honorably. Maybe he had liked our little talk after all.